"Between Riverside and Crazy" stars, from left, Stephen McKinley Henderson, Elizabeth Canavan, Michael Rispoli, Rosal Colon and Ray Anthony Thomas. The two-act play, a world premiere, has just opened at the Atlantic’s Linda Gross Theater. 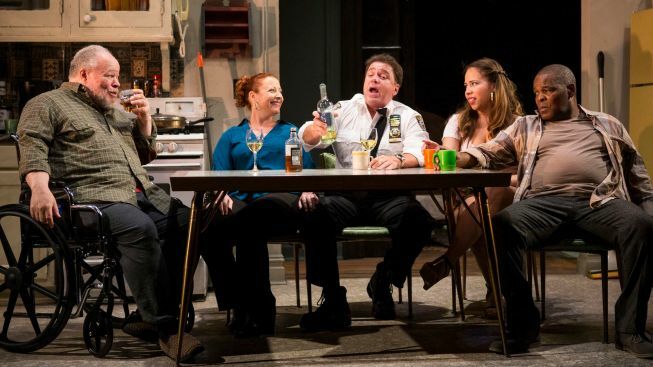 With “Riverside,” playwright Stephen Adly Guirgis again employs trademarks such as a place-specific title (he also wrote “Our Lady of 121st Street” and “The Little Flower of East Orange”), and rich, whip-snap dialogue that reliably strays into the profane. The “address” alluded to in the play’s name is a pre-war that would fetch 10 times what the landlord is now getting, if only disabled ex-cop Walter “Pops” Washington would move out. But Pops (Stephen McKinley Henderson, “Fences”) just ignores the eviction notices that keep arriving at his door: “I’m a war veteran senior citizen with a legal rent-control lease from 1978, and I never pay late. I wish they would try to f--- with me,” he tells son Junior (Ray Anthony Thomas). As “Riverside” begins to unfold, Pops is drowning his sorrows in pie and whiskey. And such sorrows Pops has! There’s that no-good son, an ex-con. The elderly man profoundly misses his late wife, and is nearly paralyzed with regret over their final years together. And, he’s embroiled in a long-standing suit with City Hall—nearly a decade ago, Pops was shot by a white cop in what may have been a racially motivated incident. This suit has become the focus of Pops’s life, and the action in “Riverside”—there are a few too many distractions before we finally get to it—is largely driven by the arrival of his loyal ex-partner (Elizabeth Canavan), and her fiance, a ladder-climbing lieutenant (the wonderful Michael Rispoli), who show up one night with what are probably good intentions: they want Pops to accept the settlement offer that’s on the table from the city… a move that, they suggest, also will allow someone powerful, somewhere to put to bed all that eviction nonsense. Hmm. An ultimately unnerving story about human nature, “Riverside” has so much going for it that it insists on your attention, even though it’s depressing as all get-out. First, consider Guirgis’s robust dialogue. When Rispoli’s Lt. Caro gets serious and asks Pops about dropping the suit, he tells the old fella: “The truth is nobody cares about your case anymore, except you—and maybe the Village Voice.” A riff about being a cop in the years when “the Bronx was burning” segues, surprisingly, into a touching commentary by Pops on his late wife’s culinary acumen, or lack thereof. Guirgis’s risks with language don’t always land their mark. I’m not sure how Pops can make, in various frames of mind, allusions to Kim Kardashian and Justin Bieber, but claim to have never heard of Ben Affleck (“Who’s that?”), when we learn that Lt. Caro bested the actor in a poker tournament. And, Guirgis’s writing for Canavan’s detective, the ex-partner, sometimes lands with a thud. The lapses are forgivable. That’s largely thanks to Henderson, the formidable stage vet known for his interpretations of August Wilson characters, and just seen last season in “A Raisin in the Sun.” Henderson’s Pops is a man so steady in his convictions, and so relatable in his pain, that it wasn’t until several hours after I’d left the theater that I realized what a bitter and pitiful guy Pops really was. Henderson paints a damn fine portrait of a man who has so convinced himself of his own life’s exaggerated narrative that even he’s surprised when parts of it begin to splinter. The strong supporting cast includes a variety of multifaceted, if scurrilous, characters Pops has opened his home to, among them actor Thomas, as son Junior; Victor Almanzar, as Oswaldo, another ne’er-do-well in need of a father figure; and Rosal Colon as Lulu, Junior’s girlfriend, who’s looking to sink her claws into Junior any way she can. Of particular note is Liza Colon-Zayas (above, with Henderson), a veteran of seven Guirgis plays, as an unexpected caretaker from a local church. This “church lady” is literally unexpected—Pops had anticipated a different, more grating one in her place, and is caught off-guard by the newcomer’s charisma, even though she, like everyone else here, is operating off a set of complex motives. The production is helmed by Austin Pendleton, the always-working actor-director who was Tony-nominated three decades ago for guiding Elizabeth Taylor’s performance in “The Little Foxes.” Walt Spangler’s efficient turntable set displays to lovely effect the dated rooms of Pops’s railroad apartment. Pops is a man dealt an unfortunate blow by fate. Guirgis and Henderson’s grand accomplishment is in convincing us of Pops’s resilience, when he is, in fact, a man irreparably damaged. You can’t help but care about the old man, even as he leaves you wondering how many wrongs it will take to make everything all right. “Between Riverside and Crazy,” through Aug. 16 at the Atlantic’s Linda Gross Theater, 336 W. 20th St. Tickets: $20-$65. Call 866-811-4111, or visit atlantictheater.org.